The purple or half-moon angelfish is an infrequent import from the waters at the extreme south of its natural range in the northern Philippines where it is being collected with increasing frequency for the aquarium trade. This beautiful dwarf angelfish is found in some reference books under the Latin name Paracentropyge venustus, a genus name that is not currently seen as valid. This will inevitably change in the future as scientists bicker amongst themselves to sort the taxonomy out but we had best leave them to it and concentrate on the husbandry of this species. In common with the other ex-member of the genus Paracentropyge, the multibanded angel (C.multifasciatus) see inset, the purple moon is a fish of overhangs, ledges and caves where it can be observed swimming upside-down in a secretive manner. For this reason it has been suggested that dimly-lit aquaria are preferable but given the acquisition of a healthy specimen that is feeding enthusiastically this species grows hugely in confidence and will swim in the open brightly-lit waters of reef aquaria albeit never too far away from a suitable bolt-hole. 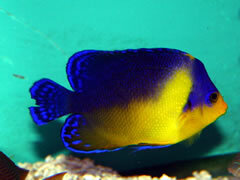 Fit is vitally important that only feeding specimens should be purchased although the purple moon angel is nowhere near as finicky as the multibanded and should pick from a selection of foods including mysis, brine shrimp and dried algae, the latter being very important for long-term health.